We are probably in the middle of the biggest disruptive change in the market since industrialization. The market structure, its nature and the key success factors are undergoing a shift where hypercompetition is putting many of today’s businesses at risk of exclusion from the market. The main causes are increasingly rapid digitization and automation at a time of record low interest rates and more venture capital being available than ever before. And this is happening on a global level. The external environment creates new conditions that all organizations must address. If companies in the Nordic market do not alter their business models fundamentally, there is a risk that Swedish Innovation miracle (on the Nordic Market) might just become an innovation mayfly. At the same time, for those entrepreneurs who succeed in acting according to the new conditions and who can take advantage of the opportunities, this creates new positions and the ability to achieve success at a pace never seen before. Happily, there are specific steps that can be taken by those who are threatened by these market changes. The measures we outline below have proven to be successful in real situations with real businesses. However, the measures require some courage, self-awareness and, above all, knowledge. We recognize four distinct scenarios in the Nordic (and European) market which even established companies have fallen into and which have even destroyed businesses and are a real threat to yours if you have fallen into any of the scenarios: “Analysis paralysis”, “Booby trapped”, “No pain, no gain” and “Too little – too late”. Many companies find it difficult to generate sufficient and sustainable ideas. Either they find too few ideas or they have the wrong ideas, or, in the worst case, they do a combination of the two. We call this the “Analysis Paralysis” scenario. Many companies are stuck with a legacy of fossilized architectures and all that entails, including the need for extensive maintenance and problems with development to keep up with changing markets. Often engineering-talented companies have invested in customized solutions, a development that is reflected for example in Industry 4.0 in Germany and user-generated manufacturing in USA. This trend has led to a situation where the management is either non-existent (chaos) or overly bureaucratic (cement). Both cases may allow rapid improvements to be made, with the potential for high profitability and effective aftersales, to meet new competition. However, in both scenarios companies are seemingly able to innovate rapidly but at the cost of maintaining its products and solutions, due to their expensive legacy architecture (for overmanaged and bureaucratic firms) or due to aftermarket with maintenance issues (for the chaotic unmanaged firms) means that they are unable to obtain full product/service value over time, despite being quick to market. Many companies have business models that no longer work. However, not continuously innovating and/or developing their business models may be a decisive mistake when competitors are faster to act and e.g. maximize the application of new business models of the sharing economy, such as crowdsourcing, crowdfunding and subscription-based models. Uber, the App Store, Dropbox and Spotify are just some examples of new “sharing-based” business models. Basically, this scenario is about understanding the customers’ “pain” and “gain” – what do the customers actually want and how are they prepared to pay? Many companies feel that they are late to the market. They may be knocked out of the market by new models. For example, nowadays, a global network of actors based on semi-finished products from several distinct steps can create an equivalent value by offering lower prices with attractive business models focused on specific activities or lean start-ups with plenty of venture capital prior to the market when opportunities begin to open up. Typical examples that were caught out and came late to the market include Kodak, which was late to move towards digital photography, the established auto industry, which was too slow to develop electric cars, and energy companies, who were slow to see that consumers could start to produce and sell their own electricity into the grid. Analysis paralysis – to stick or move ahead? What is it that would make a plant employee with a monotonous job (often performed for many years without any improvement in working practice) go home and seek out or create innovative solutions in areas not related to their work employment, for example building their own electric car or making their homes climate-smart? Or what would make an employee start a new smart app-based service outside of their work area? Or the teacher who suddenly starts their own business? How and why do people make these changes away from their work environment instead of changing and creating ideas in the activities in which they are active at work? People are often full of new ideas in the areas they are interested in. So, why are businesses so bad at channelling this creativity towards their own business operations? A natural answer is of course is that some people naturally have the desire to make something on their own, but beyond that, perhaps the most common cause is that in the place of employment, maybe there is no destination for new ideas. This also applies to new ideas from customers or suppliers. When organizations are overconfident, there is a risk that they may stagnate, which ultimately creates a paralyzed situation, where the flow of ideas completely ceases, first as people may feel the company is not responsive to receiving ideas and then as they lose the will to offer ideas in such a negative ideas culture. To address this, business structure, culture and leadership are some key elements to help identify, encourage, uncover and structure ideas. The ideas are out there in the real world, not behind a desk. Also, in a typical life cycle of a company with a stable market position, they often reach a point where management’s gaze turns inwards, and becomes focused, even fixated, on efficiency and consolidation. In effect, consolidating the status quo becomes more important than innovating and renewing for the future. One solution to overcoming this is to insert simple and proven methods of “ideation scouting”, “ideation hunting “and field observations into the business strategy. There are tools available that can help companies collect, illustrate and visualize ideas and solutions in a structured way, so that they then can be rapidly developed further, tested and ultimately discarded or launched as a new product or service. Practical experience shows that these methods also lead to increased efficiency, a reduced need for write-downs and a shorter time-to-market. To succeed, companies need greater crisis awareness, the right skills and tools, and a clear plan with definite milestones. Then, they can escape from their analysis paralysis. Booby trapped – Locked away in the market preferences or out-of-the-box thinking? Customization and specialization have long been important success factors in businesses in the western world. Covering everything from cars to houses, to equipment and to IT-systems; these have been the typical responses to compete against production from low-cost countries. New technologies such as 3D printers and connected factories have reinforced this trend, particularly in the manufacturing industry. The demands on platform thinking in everything from design and construction to operation has placed growing demands on the need for flexibility, which in turn has led to the trend for flexibility, rather than the traditional approach of customization and specialization. For instance, now modular development, scalable and flexible architecture and smart hybrid solutions where, for example 3D printers are used produce some special components (e.g. mounts, mountings, fittings) are now beginning to emerge. However, a company specially producing services and products often suffers from architectural problems, which may make it more difficult to scale up volumes and can lead to higher costs for operating and maintenance, which ultimately ties up working capital. The solution is an innovation process that shortens the time from prototype to launch. This requires an ability to build in more flexibility in architectures, product-lifecycle management, platform and modular design, engineering, production and operation. Companies cannot afford to be locked in rigid architectures over time, as this can create obstacles for taking advantage of new business opportunities. While maximizing cash flow from existing platforms, companies need to be working on the next-generation architectures and the generation after that. A framework that is often used in architectural development is the “Three Horizon Model”, where companies work on three architectural levels simultaneously: today with existing cash, the future with flexible production, as well as the next level that will next take over. The key is to maximize what you have today without being locked out of the market. Understanding a client’s real motive is the key to also understanding how the business model can be developed further. One known example of selling what customers want is reflected in a quote from Black & Decker’s CEO: “Last year, one million quarter-inch drills were sold. Note, this was not because people wanted quarterback inch drills but because they wanted quarter-inch holes”. With the realization that there are holes that the company can sell for, the company asked itself, can drill machines be adapted to the different contexts in which clients need these holes as well as for the amount of holes which customers need? Some models of drills may be slightly easier and cheaper, but are fit-for-purpose as long as they do the job. Others may be of higher quality and more durable, so they can be rented out as may be only sporadic needed for holes. However, this further improves the dynamic between buyers and sellers, and is another example of today’s diversity of channels and formats to deliver. Consumers are now helping to develop, finance and produce value offerings. In the digital world, channels are being developed by consumers with each other as never before. The sharing economy now gives the established players competition that they could not have imagined just a decade ago. Therefore, constantly innovating your business model and your offerings is an essential success factor in today’s markets. A strategic continuous innovation of your business model should be based on what you do best (sometimes called your operational DNA) and matched against what your customers most want. And how much this is worth to them! Static models, a lack of strategic direction, a poor understanding of customers’ dominant motifs and altered behaviours coupled with not understanding their own strengths in depth have led to the demise of probably more companies than the worst recession has ever done. However, there are several toolkits to help innovate business models, and that can help capture customer needs, design the value proposition and map the actors involved in production and delivery. Not to come out on time with new offerings is one of the most common reasons that companies slowly lose value and are eventually knocked out of the market. Typical causes are sluggish internal bureaucracy, lack of runways for innovation, an absence of an external innovative context to work in and a naive approach to the way markets are changing. Companies that find themselves in such impasses often address it by adopting new business models based on a fast-moving value network of suppliers. Not only are these competitors faster to market when new demand arises, they can also squeeze prices and short-term test different variations of business models. New value networks, combined with new production techniques can affect the time-to-market radically. Today, for example, it is possible to build a satellite (excluding the launching mechanism) for only US$ 10,000, which is many times cheaper than even a few years ago. This is a consequence of the finished components, specialized industrial clusters and a globalized market. Future innovation processes are not about doing everything yourself behind locked behind doors, but rather about participating in open platforms in which many players interact. Customers and partners can develop products and services faster, along with the customer prototyping all the ideas and delivery formats into actual products and services. In this diverse market climate, a stable vision reference point is increasingly important. This is also important in order to “choose the right balls” and then to focus all effort on them instead of randomly kicking the balls that arise in the hope that some of them might go into the net. However, this is only possible with a well thought-out process of innovation. To implement a structured innovation process that captures and rewards diversity of ideas externally and internally, and then quickly and efficiently boils down the essence and commercially chooses the right idea to quickly take to market is the key to success. A rapid speed to market is achieved today by utilizing proprietary systems and other benefits so as not to have to invent a new ecosystem and value networks for delivery or worse still, to avoid launching new products without ecosystems and value networks (i.e. no internal runways or external infrastructure, such as service, training, inventory, availability and knowledge). For an organization to take on innovation seriously, it needs to define its strategy for innovation and the kind of innovation it intends to work with and, not least, ensure that the right ‘innovation capabilities “are in place. 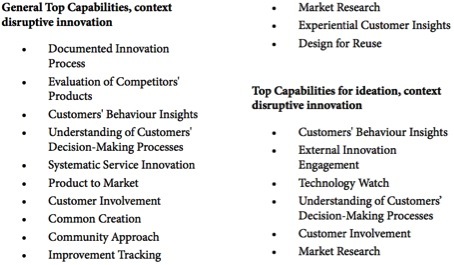 Below are the main innovation capabilities that companies in North America have used in successfully managing to face the four threats described above (which ultimately are about disruption), according to the Innovation 360 Group database. This is something that can be directly used by Swedish and Nordic companies in international competition with North American companies that may have a little stronger capacity for innovation, but that have the same basic profile regarding their innovation efforts. Contrary to many myths, innovation capability is less dependent on talent and is more about acquired skills and experience. Here, interest and commitment, combined with knowledge of the processes and tools are critical success factors. However, innovation is not well trained for in the Nordic market, particularly in higher education courses for working professionals. Therefore, Innovation 360 Group and the Computer Association have initiated the training #InnovateSweden, a four-day course that addresses the basic tools and also allows participants to apply them to their own business. You are welcome to participate in #InnovateSweden – our contribution to a more successful Nordic market, read more at http://www.dfkompetens.se/utbildning/innovatesweden. You can also join the information event the 5th of October, read more here.